We selected 142 old windmills that are renovated and in a good condition. So, even if you can maybe not visit the interior the moment that you are there, they will certainly allow you to shoot some nice pictures. 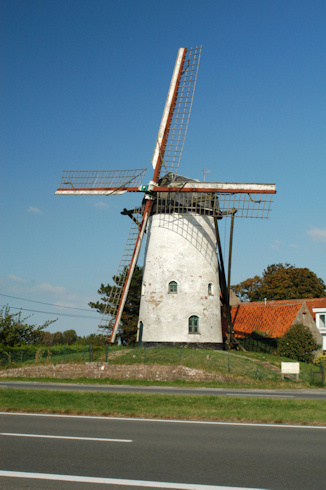 As you will see on the map, all, except 4 or 5, of these windmills are situated in Flanders. In the South there were many water mills, but not many of them are still worth a visit, as they are often not accessible or in a very bad condition. Not much effort has been undertaken to save these monuments of the past. 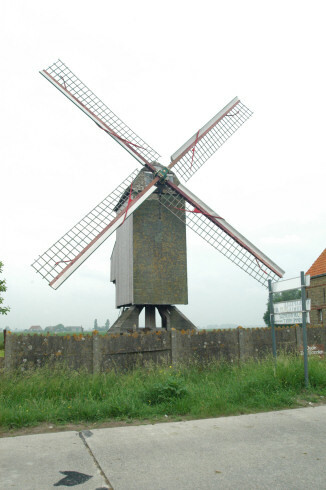 In Flanders a "Windmill" is called a "Wind Molen". 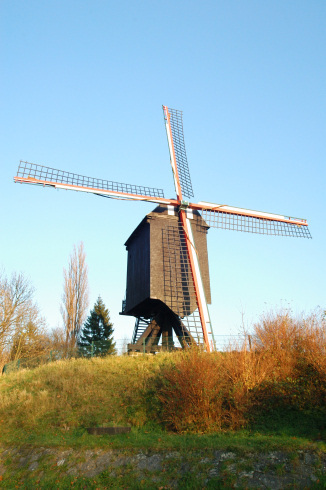 In Wallonia you will read "Moulin à vent". We have selected the windmills for their nice outside look, so that you can always take some nice photos. But if you could visit the interior, that would even be better. If we have information about opening periods and hours, we will indicate it below this table in the "Some more info" chapter. 1 Bakkersmolen in Wildert. Flour mill from 1981, now in use as bakery museum. Open on Saturdays and Sundays from 10 AM - 6 PM. In the summer months every day. On the domain one can find a lot of vapor engines. Behind the mill is a steam vapor museum. 2 Arbeid Adelt in Weelde. Flour mill in bricks from 1850. In 1906 restored after a fire. Operational. Grinds every Thursday evening from 6 PM - 10 PM and every Sunday morning from 8.30 AM - Noon. 3 Salm-Salm Molen in Hoogstraten. Flour mill in bricks from 1380. Rebuilt in 1708 and in 1902. Can turn, but not fully operational. 4 De Nachtegaal in Ravels. The complete name of this flour mill in bricks from 1869 is "De Nachtegaal der Maatvennen" (Nachtegaal = Nightingale). Open on Monuments and Mills days, when the mill turns. 5 Stenen Molen in Brecht. Flour mill in bricks from 1842. On a hill. Operational. Open On Sundays from 1 PM - 5 PM. 6 Stenen Meulen in Rijkevorsel. Flour mill in bricks from 1845/1862. Restored in 2001. Operational. Open every second and last Sunday of the month from 1 PM - 5 PM. 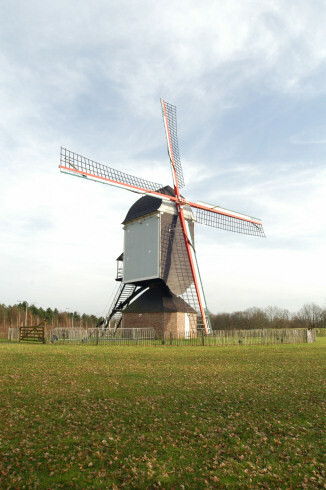 7 Buitenmolen in Berendrecht. Flour mill in bricks from 1822. Operational. Open only by appointment. 8 Toremansmolen in Arendonk. Octagonal wooden flour mill and oil pressing mill from1809. Operational. Open From May - September every last Sunday of the month from 2 PM - 5 PM. 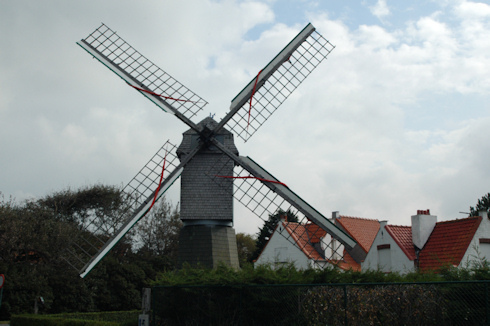 9 Kalfmolen in Knokke-Heist. Wooden flour mill from 1681. Needs some restoration. Cannot turn now. 10 Scheldemolen in Doel. Flour mill in bricks from 1614. Not functioning anymore. Is now a café-restaurant. There must exist many thousands of photos of this mill with the modern nuclear power plant as contrasting background. The mill could be dismantled and displaced in the near future, because of the extension of the Antwerp harbor. 11 Callantmolen in Ramskapelle. Flour mill in bricks from 1897. Ready to grind. Open on appointment and when the restaurant is open. 12 De Eenhoorn in Lillo. Flour mill in bricks from 1735. Dismantled and displaced in 1967. Restored in 1997. Operational. Open from May - September every last Sunday of the month from 1 PM - 6 PM. In August from 10 AM - 6 PM. 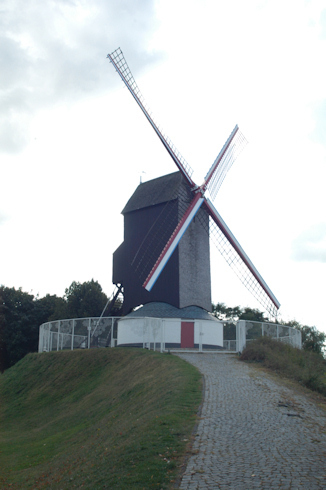 13 Scherpenbergmolen in Westmalle. Flour mill in bricks from 1843. Operational. Open every Sunday from 1.30 PM - 5.00 PM. Turns when the wind conditions are good. 14 Hoekemolen in Hoeke. Flour mill in bricks from 1840. Operational. Open every Sunday from 10 AM - Noon. 15 Hubertmolen in Wenduine. Wooden flour mill from 1880, restored in 1994. Operational. Open Third Sunday in June, on the mill days and open monument days. 16 De Heerser in Retie. Wooden flour mill from 1794. In 1934 dismantled and displaced to the actual location. Operational. Open by appointment. 17 In Stormen Sterk in Gierle. Flour mill in bricks from 1837. Actually in restoration. Will be operational again in 2008. 18 Dorpsmolen in Oostkerke. Flour mill in bricks from 1875. Operational. Open from April 1 - September 30 every first Sunday of the month from 2 PM - 6 PM. 19 Napoleonsmolen in Hamont. From 1804, built in bricks. Grinds corn on demand. Open The first and the third Sunday of the month from 2 PM - 5 PM. 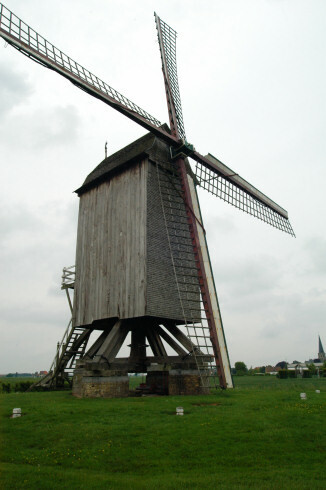 20 Schellemolen in Damme. Flour mill from 1867, built in bricks on an artificial hill. Restored in 1971. Open from June 1 - September 30 on Saturdays from 2 PM - 6 PM and on Sundays from 10 AM - 6 PM. In July and August also on weekdays from 10 AM - 5.30 PM. 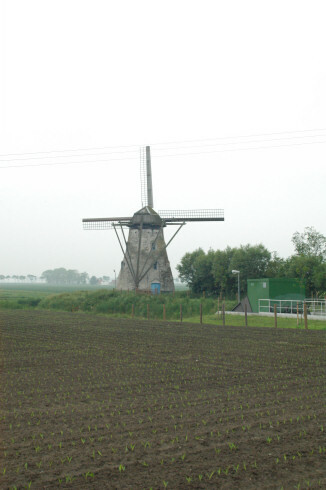 21 Keeses Molen in Kasterlee. Wooden standard mill from 1650; Rebuilt several times on different locations. Restored in 1970. Operational. Can be visited on the second Sunday of the month. 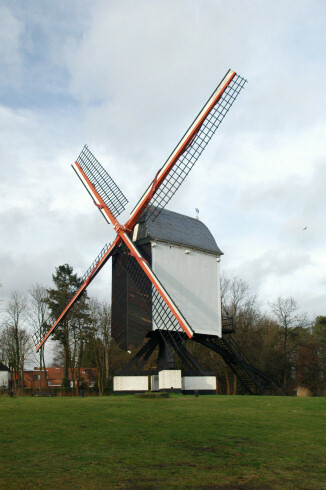 22 De Nieuwe Molen in Sint-Huibrechts-Lille. Flour mill in bricks from 1820. Dismantled and displaced in 1908. Restored in 2000. Operational. Open from April - October every second Saturday of the month from 2 PM - 5 PM. 23 Molen van Sint Anneke in Antwerpen. Wooden flour mill from 1775. Rebuilt in 2001. 24 Stenen Molen in Pulderbos. Flour mill in bricks from 1840. Operational. Open every Sunday from 1 PM - 6 PM (5 PM during winter months). 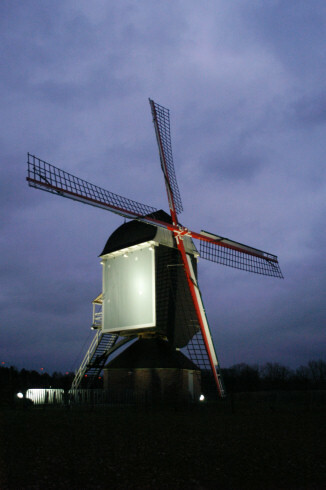 26 Leyssensmolen in Lommel. Wooden flour mill from 1797. Rebuilt in 1808. Dismantled and displaced in 1963. Restored in 1989. Since 2003 not operational anymore, as a thorough restoration is needed again. 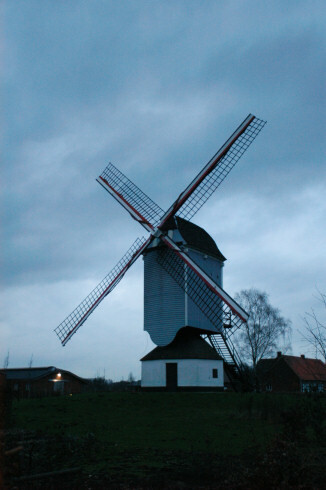 27 Molen van Oelegem in Oelegem. Flour mill in bricks from 1845. Operational. Open every second Sunday of the month from 11 AM - 5.30 PM. 28 Koeleweimolen in Brugge. Wooden flour mill from 1765. Rebuilt in 1996. Open in July and August from Tuesday - Sunday from 9.30 AM - 12.30 PM and from 1.30 PM - 5.00 PM. 29 De Nieuwe Papegaai in Brugge. Wooden windmill from the 18th century, rebuilt in 1970. It was an oil mill, but now the interior is almost empty. Can not be visited. 30 Sevensmolen in Overpelt. Wooden flour mill from 1745. Rebuilt in 1853 and in 1962. Operational. Open on Mills days and by appointment. 31 Sint-Janshuis Molen in Brugge. Wooden windmill from 1297. Rebuilt in 1770 and restored in 1964. Can be visited from May - September, daily from 9.30 AM - 12.30 PM and from 1.30 PM - 5.00 PM. 32 Molen van het Veld in Geel. Wooden flour mill from 1796. Rebuilt in 1993. Operational. Open from May - September on Sunday afternoons from 1 PM - 6 PM. 33 Sevensmolen in Kaulille. Flour mill in bricks from 1891. Operational. Open every second and fourth Saterday from 1 PM - 6 PM. 34 De Bonne Chiere in Brugge. Wooden mill from 1844. Rebuilt in 1911 on four brick socles. Outside in good condition. Inside empty. Can not be visited. 35 Keijersmolen in Molenbeersel. Flour mill in bricks from1869. Operational. Open on Mill days and by appointment. 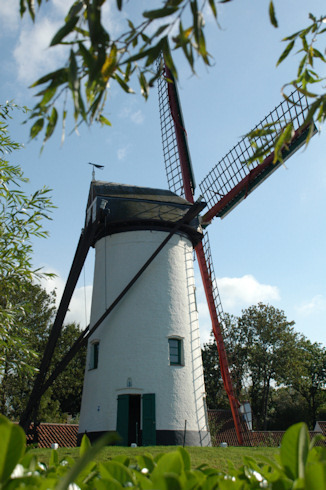 36 Zorgvlietmolen in Molenbeersel. Flour mill in bricks from 1817. Restored in 2002. However needs a new restoration. 37 Molen van Ezaart in Mol. Flour mill in bricks from 1856. Operational. Opening hours: Tourist Office Mol. 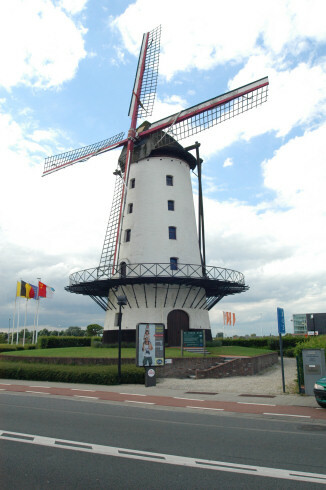 38 Westermolen in Lembeke. Wooden flour mill from 1785. Operational. Open by appointment. 39 Stenen Molen in Ertvelde. Flour mill in bricks from 1798. Operational. Open by appointment. 40 Molen van Larum in Geel. Wooden standard flour mill from 1846. Last restoration in 2002. Operational. Open every last Sunday of the month and by appointment. 41 Lemmensmolen in Kinrooi. Flour mill in bricks from 1856. Operational. Open by appointment. 42 Molen van Bouwel in Bouwel. Wooden flour mill from 1925. Operational. Open only by appointment. 43 Stermolen in Eksel. Wooden flour mill from 1901. Fully operational. 44 Buulmolen in Olen. Wooden flour mill from 1362. Rebuilt in 2002. Operational. Open every last Sunday of the month from 1.30 PM - 5.00 PM. 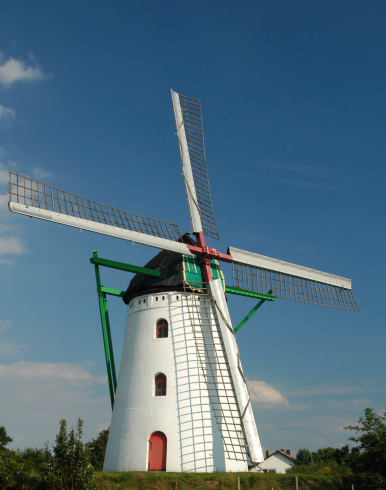 45 Witte Molen in Sint-Niklaas. Flour mill in bricks from 1696. Operational. Open every other week on Sundays. 46 Stenen Molen in Boechout. Flour mill in bricks from 1782. Operational. Open every Sunday from 1 PM - 6 PM. 47 Hogewegmolen in Noorderwijk. Wooden flour mill from 1842. Operational. Open on Mills days and by appointment. 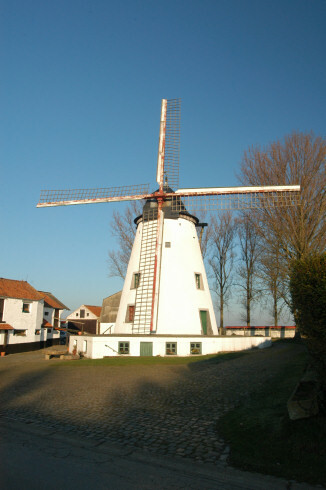 48 Witte Molen in Roksem. Corn and oil-pressing mill in bricks on a hill. Built in 1843. Restored in 2002/2003. Open every first Sunday of the month from 2 PM - 6 PM. 49 Oostmolen in Gistel. Destroyed by fire in 1977 this mill in bricks was completely rebuilt in the early 80's. Needs a new restoration again. Foreseen for 2005-2006, so in the meantime probably achieved. 50 Prinskensmolen in Meerhout. Wooden standard-mill from the 13th century. Ready to grind. Open from May - September every last Sunday of the month from 1 PM - 5 PM. 51 Gerardsmolen in Evergem. Flour mill in bricks from 1864. Operational. Open every second Sunday of the month. 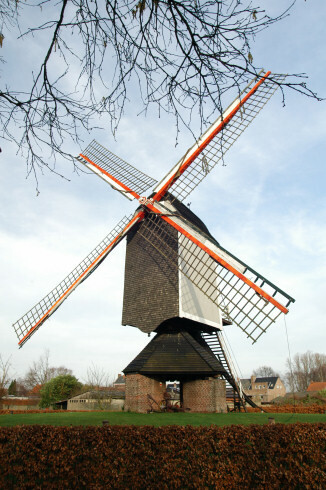 52 Haevense Molen in Meerhout. Wooden flour mill from 1943. Operational. Open from April - September every last Sunday of a month. 53 Heimolen in Aartselaar. Wooden flour mill from 1801. Open from March - October on Sundays from 1 PM - 5 PM. 54 Pietendriesmolen in Knesselare. Wooden flour mill from 1804. Operational. Open every last Sunday of the month from 10 AM - 4 PM. 55 Zuid-Abdijmolen in Koksijde. Wooden mill, rebuilt in 1954 and restored in 1984. Open from April 1 - September 30 on weekdays from 10.30 AM - Noon and from 4 PM - 5 PM. On Saturdays from 10.30 AM - Noon and on Sundays from 3.30 PM - 5 PM. 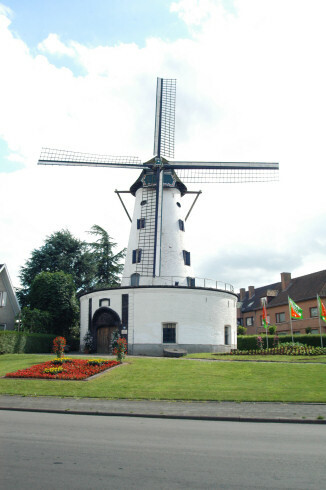 56 Heirbrugmolen in Lokeren. Flour mill in bricks from 1852. Operational. Open every last Sunday of the month from 1 PM - 6 PM. 57 Zephyrusmolen in Ruddervoorde. Small flour mill from 1990. The mill is constructed in steel with bricks on the interior. Open by appointment. 58 De Grote Napoleon in Hamme. Mill from 1817, built in bricks on top of a hill. Still grinds corn. Can be visited during the Summer months. 59 Kaasstrooimolen in Heist-op-den-Berg. Wooden flour mill from 1611. Operational. Open every Sunday from 2 PM - 6 PM. 60 Hovenaeremolen in Koekelare. Flour mill in bricks on a hill. Actual mill from 1923. Operational. Open from May - September every first and third Sunday of the month from 2 PM - 6 PM. 61 Molenhoekmolen in Ruddervoorde. Small wooden flour mill in scale 1 : 2 from 1986. Open by appointment. 62 Oude Molen in Tessenderlo. Wooden flour mill from 1728. Last restored in 1991. Operational. Open from May 1 - October 31 every last Sunday of the month. 63 Oude Zeedijk Molen in Avekapelle. Wooden flour mill from 1745. Last renovation from 1996. Operational. Open by appointment. 64 Duiveltje-der-Nachten in Veurne. Small grain mill from 1979. Wooden construction. Open the same periods as the neighboring bakery and museum. 65 Sint-Karelsmolen in De Moeren. 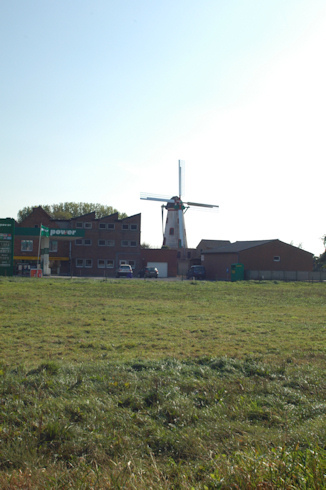 18th century mill in bricks, built to gain land from the sea by draining the polders. Restored in 1978, but new restoration needed again. 66 Knokmolen in Ruiselede. Operational windmill from 1840, built in bricks. On Saturday afternoons there is a good change that the mill turns, when enough wind, of course. 67 Hostensmolen in Ruiselede. Flour mill in bricks from 1770, restored in 2001. 68 Kouter Molen in Kortemark. Wooden flour mill from 1410. Needs a serious restoration. 69 Nieuw Leven in Leut. Wooden flour mill from 1801. Restored in 1995. Operational. Open every first and third Sunday of the month. 70 Kruisstraat Molen in Werken. Wooden flour mill from 1773. Operational. Open from April - September every first Sunday of the month from 2 PM - 6 PM. 71 Heimolen in Gijmel. Wooden mill from 1662. Fully restored in 1999 and operational. Every Sunday from 10 AM - 1 PM the mill turns and grinds corn. Can be visited during these hours. From May - October also open on Sundays from 1 PM - 5 PM, but will not work then. 72 Molen van Schaffen in Schaffen. Wooden flour mill from 1826. In 1904 dismantled and displaced. Rebuilt and restored in 2002 - 2004. Open every first and third Sunday of the month from 10 AM - 1 PM. For groups also by appointment. 73 't Merelaantje in Londerzeel. Wooden mill, constructed in Gistel in 1930. 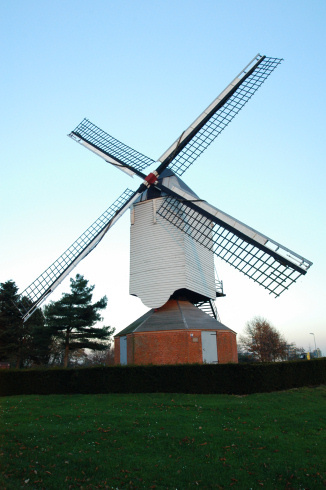 It was one of the two first mills in Europe built to produce electricity. In 1973 displaced to Londerzeel and since 2003 communal property. In September 2007 the mill-wheel has been taken down, as the mill needs an important restoration. Will be finished in 2008. 74 Hartemeersmolen in Poeke. Flour mill in bricks from 1810. Last restored in 1977. Operational. Open on most Sundays. 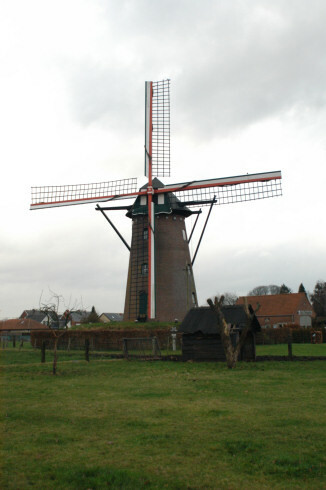 75 Mevrouwmolen in Kanegem. Flour mill in bricks from 1844. Will be dismantled end 2007 and fully restored. In September 2009 we found the mill in this state. 76 Koutermolen in Sint-Martens-Latem. Wooden flour mill from 1373. Several times restored. Actually (end 2007) dismantled for another important restoration. 77 Heidemolen in Malderen. Wooden flour mill, till recently operational. The wings are in a bad shape and will be restored in 2008/2009. Till than the mill is closed. 78 Wullepit Molen in Zarren. Wooden flour mill from 1623. Rebuilt in 1923 and in 2000. Operational. Open in July and August every Sunday from 2 PM - 5 PM. 79 De Windmolen in Zwijnaarde. Flour mill in bricks from 1818. Only partly restored, not operational. 80 Couchez' molen in Zarren. Flour mill in bricks from 1870. Several times restored. Last restoration in 2003. Operational. Open from April - September on Sundays. 81 Lindemolen in Diest. Wooden flour mill from 1742. Several times rebuilt. Restored in 2004. Operational. Open every first Sunday of the month from 2 PM - 6 PM. 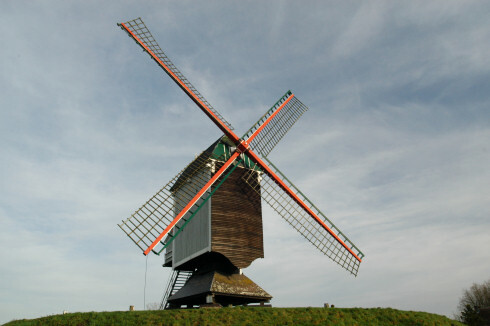 82 Grijspeerd Molen in Gits. Wooden flour mill, originally from 1771. Several times dismantled, restored and displaced. Last time in 1982. Now fully operational. Open from April - September every second Sunday of the month from 2 PM - 5 PM. 83 Galgenmolen in Genk-Bokrijk. Octagonal wooden flour mill from 1800. Dismantled and displaced in 1954 and restored in 1997. Operational. Open from April 1 - October 1. 84 Stalijzermolen in Leisele. Wooden flour mill from 1804. Several times restored. Last time in 1995. Operational. Open every Sunday from 1 PM - 6 PM. 85 Rijsselende Molen in Ardooie. Flour mill in bricks from 1767. Rebuilt in 1855. Last time restored in 1999. In the mill is now a restaurant. Plans exist to make it fully operational again in 2008. Open daily from 10.30 AM - 10 PM. On Fridays from 5 PM - 10 PM. 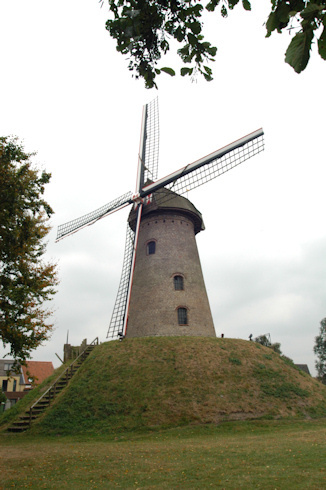 86 Poelbergmolen in Tielt. Wooden standard flour mill from 1726, placed on a hill (Poelberg). Operational since restoration in 1993. 87 Standardmolen in Domain Bokrijk in Genk. Wooden flour mill from 1788. Rebuilt in 1955. Open from April 1 - October 1. 88 Markey Molen in Pollinkhove. Wooden flour mill from 1797. Last time restored in 1993. Operational. Open in July and August, every Sunday frm 3 PM - 7 PM. 89 Moedermeule in Aarschot. Built in Mechelen in 1667. Moved to Aarschot in 1839 and restored in 1976, this wooden standard-mill turns every Sunday afternoon, if enough wind, and can be entirely visited. 90 Schelderomolen in Schelderode. Flour mill in bricks from 1821. Rebuilt in 1907 and restored in 1994. Operational. Often turns on Sundays. Open for visists only on Mills days. 91 Stormvogel in Boorsem. Built in bricks on a hill in 1858. Could use some restoration. Open by appointment. 92 Fauconniersmolen in Oordegem. Flour mill in bricks from 1845. Rebuilt in 1984. Operational. Open on Mills days and by appointment. 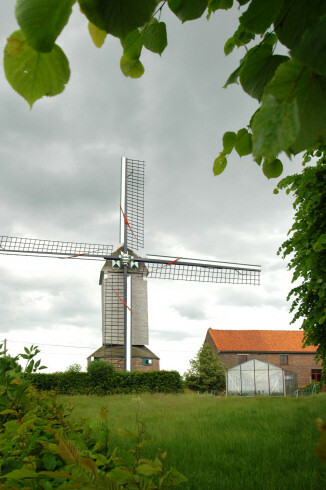 93 Beukelaere Molen in Merkem. Wooden flour mill from 1777/1923. Restored in 1984. Operational. Open by appointment. 94 Herent Molen in Meulebeke. Wooden flour mill from 1600, rebuilt in 1922 and in 1956. Last restoration in 2005. Operational. Open by appointment. 95 Brouckmolen in Beveren-aan-de-Ijzer. Flour mill in bricks from 1872. Operational since restoration in 1994. Visits on Saturday afternoons and by appointment. 96 Kazand Molen in Rumbeke. Built in brick in 1813 and completely restored in 1954. 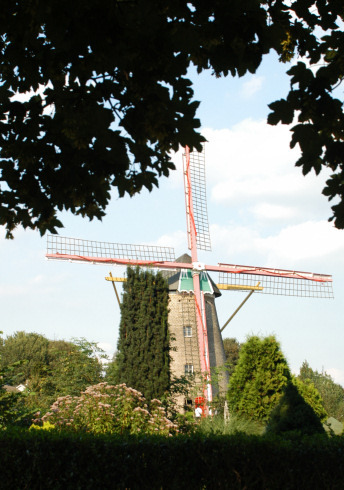 97 De Meesters Molen in Oostvleteren. Wooden flour mill from 1760, rebuilt in 1973. Last time restored in 2004. Needs new restoration works. Open from May - September every third Sunday of the month from 2 PM - 5 PM. 98 Windekemolen in Balegem. Wooden flour mill from 1822/1910. Renovated between 1984 and 1988, but final result was not good. 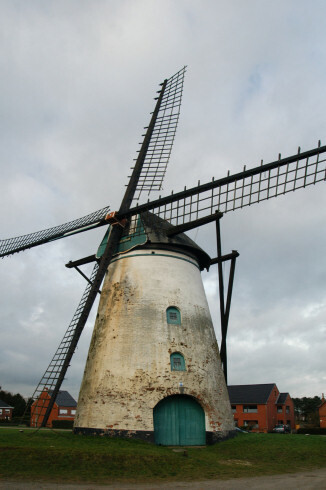 In 2007 the mill should be restored again and become operational again. 99 Geotinnemolen in Balegem. Mill from 1798, not operational anymore. Proprietary of the town. Protected as a monument. 100 Kruiskoutermolen in Mere. Wooden flour mill from 1632. Several times displaced and repaired. Since June 3, 2006 fully operational at its actual location. Open on Sundays from 1 PM - 5 PM. 101 Meuleke 't Dal in Zingem. Wooden flour mill from 1388. Operational. Open: often on Sundays. 102 Klepmolen in Balegem. Flour mill in bricks from 1889. Operational. Open only by appointment. 103 Huisekoutermolen in Huise. Wooden flour mill, built in Waregem in 1512. In 1972-1975 moved to Huise and restored. In May of 2007 one had to take off the wings, due to damage. Will be repaired as soon as possible. 104 Muizelmolen in Hulste. Flour mill in bricks from 1840. Operational. Open from February 15 - December 15 every Sunday from 10 AM - 6 PM. 105 Steenakkermolen in Langemark. Wooden flour mill from 1790. Rebuilt in 1923. Operational. Open every Sunday from 2 PM - 6 PM. 106 Houtavemolen in Wannegem-Lede. 16th century wooden flour mill. Rebuilt in 1981 and restored in 1987. Open by appointment. 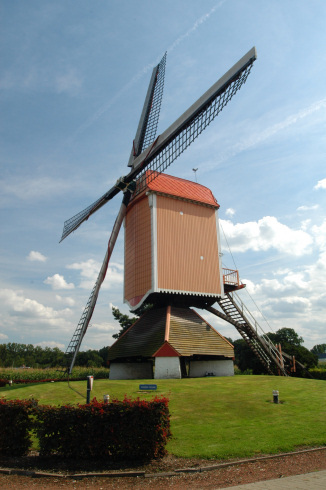 107 Molen Ter Rijst in Herzele. Mill from 1798, built in bricks. Last restored in 2006, nowadays grinds corn on demand. 108 Molen te Rullingen in Herzele. Wooden flour mill from 1750, restored in 1966 and 2002. Operational. Visits for groups on demand. 109 Stokerijmolen in Kuurne. Wooden flour mill from 1796. Operational. Open from May - September on Saturdays and/or Sundays from 9 AM - 11 AM. Closed from July 19 - August 19. 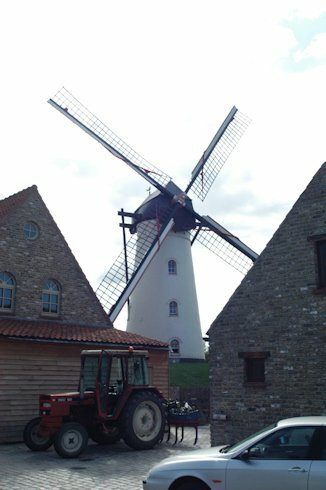 110 Molen Ter Geest en Ter Zande in Deerlijk. Flour mill and oil pressing mill in bricks from 1888; Several times restored. Last time in 2005. Operational, but needs some restoration work again. Open by appointment. 111 Verbrande Molen in Sint-Lambrechts-Woluwe. Wooden flour mill from 1767. For the last time dismantled and displaced in 1962. Operational. 112 Vinkemolen in Sint-Denijs-Boekel. Wooden construction, originally from 1686. Reconstructed in 2002. It is a flour mill. Open by appointment. 113 Tissenhovemolen in Mater. Wooden flour mill from 1768. Operational. Open by appointment. 114 Preetjes Molen in Heule. 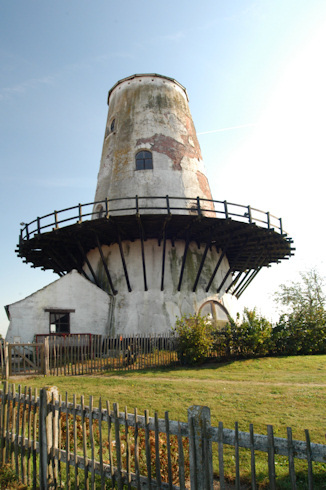 Unique and only remaining wooden windmill, used for flax scrutching. Founded in 1865. Last restoration in 1996. Operational. Open from March - October every third Sunday of the month from 2 PM - 5 PM. Closed in July. 115 Luizemolen in Anderlecht. Wooden flour mill from 1996. Operational. Open every second and fourth sunday of the month. 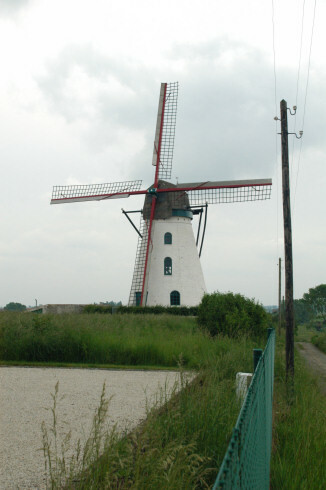 116 Koutermolen in Harelbeke. Wooden flour mill from the 18th century. Rebuilt in 1982 - 1986. Operational. Open in June and September on Saterdays and Sundays from 2 PM - 6 PM. In July and August daily, same hours. 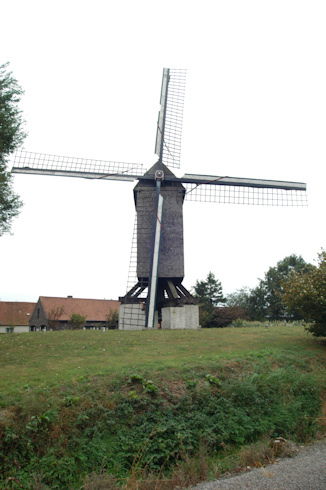 117 Landergem Molen in Anzegem. Wooden flour mill from 1781. Partly restored in 1991. Can turn, but not fully operational. Open on demand. 118 Hertboommolen in Onze-Lieve-Vrouw-Lombeek. Wooden flour mill from 1391, renovated in 2002. Open Every Sunday from 11 AM - 5 PM. Since November 11, 2007 there is also a miller's museum. 119 Wildermolen in Appelterre-Eichem. 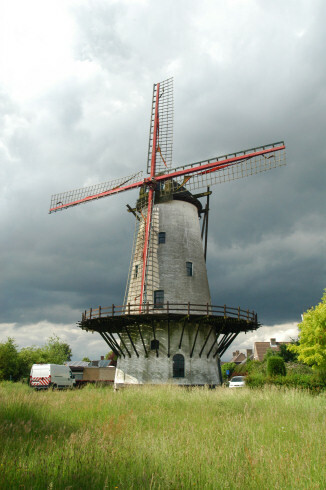 Wooden wind mill, totally restored in 1979. 120 De Grote Macht in Moorsele. Oil mill from 1817, built in bricks. Open from May - September every second and fourth Saturday of the month from 2 PM - 5 PM. 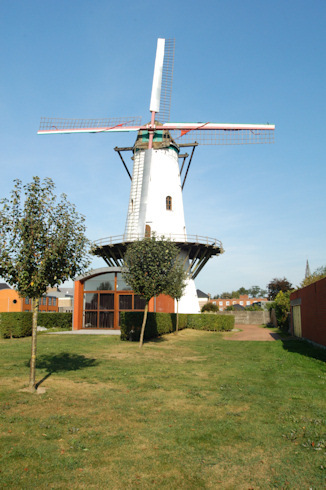 121 Vanbutseles Molen in Wevelgem. Flour mill in bricks from 1851. Restored in 1997. Operational. Open from May - September every second and fourth Sunday of the month from 2 PM - 5 PM. 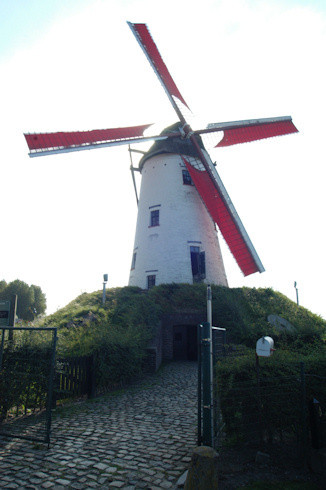 122 Bergmolen in Tiegem. Brick mill from 1880, used to press oil till 1915. Damaged during WW I, but restored. Again restored in 1970/1971 and now a flour mill. 123 Stenen Molen Zwevegem. Flour mill in bricks from 1798. Restored in 1995. Not fully operational. 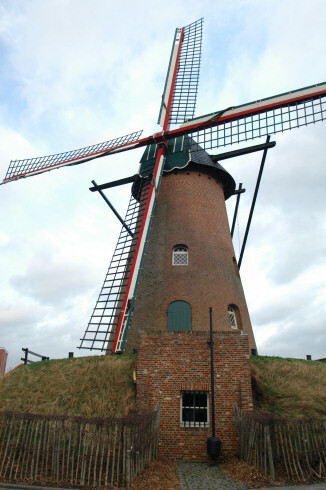 124 Mortiers Molen in Zwevegem. Wooden flour mill from 1794. Last time restored in 2001. Operational. Open on local holidays and on Mills and Monument days, or by appointment. 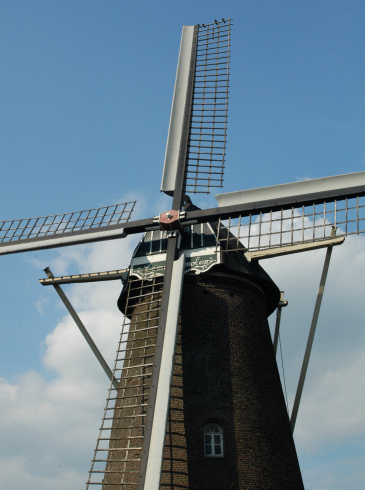 125 Vannestes Molen in Marke. Flour and oil pressing mill from 1840. Last restoration in 1990. Not operational. The mill houses a bakery museum since 2001. Open from April - September daily from 2 PM - 5.30 PM. Closed on Thursdays and Fridays. 126 Molen Ter Zeven Wegen in Denderwindeke. Flour mill in bricks from 1790. Operational and open every fourth Sunday from 2 PM - 6 PM in de period from Easter - November first. 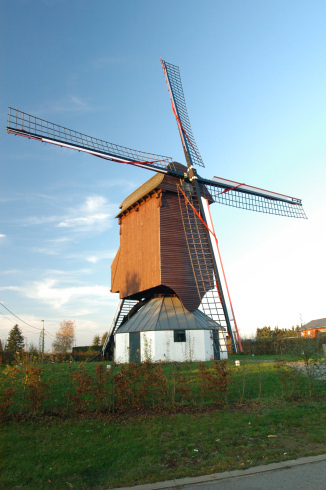 127 Bossenaremolen in Etikhove. Wooden flour mill from 1452. Displaced in 1996-1998. Operational. Open by appointment. 128 De Goede Hoop in Menen. Operational brick flour mill from the 18th century. Open from Easter - mid September every Sunday from 2 PM - 5.30 PM. 129 Verrebeekmolen in Opbrakel. Flour mill in bricks from 1803. Restored in 1997. Operational. Open every last Sunday of the month and by appointment. 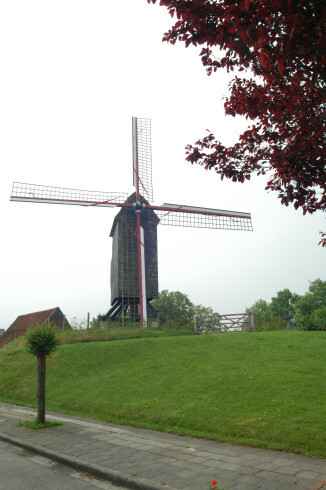 130 Kruiseke Molen in Wervik. Wooden flour mill from 1735. Rebuilt in 1922 and in 1995. Operational. Open from March -September every second and fourth Sunday of the month from 2 PM - 5 PM. 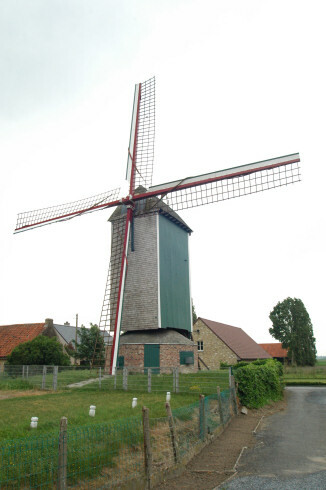 131 Moulin Soete in Comines. Wooden flour mill from 1920. Destroyed by fire in 1997. Totally rebuilt in 2001. Open from April - September on Sundays from 2 PM - 5 PM. 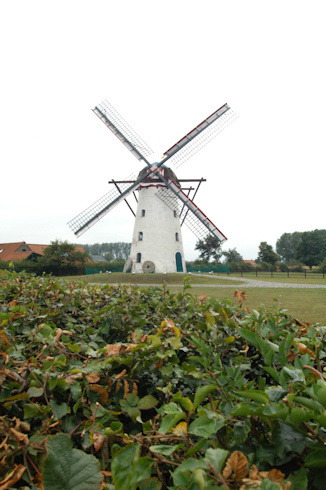 132 Lijstermolen in Westouter. Wooden flour mill from 1805. Dismantled and displaced in 1960. Can turn, but is not fully operational. Open by appointment by the Tourist Office in Heuvelland. 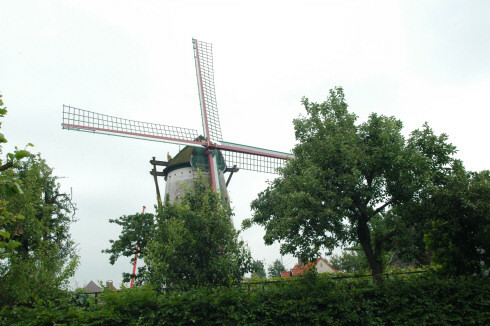 133 Molen Ter Claere in Sint-Denijs. Flour mill in bricks, originally from 1681. Several times rebuilt. Last restoration in 1987. Operational. Open by appointment. 134 Briekemolen in Wervik. Flour and oil pressing mill in bricks from 1805. Last restoration in 1994. Operational. Open from March - September every first and third Sunday of a month from 2 PM - 5 PM. The mill also houses a Tobacco museum. 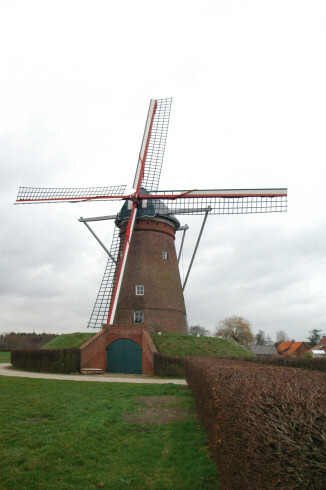 135 Hoogmolen in Aalbeke. Wooden flour mill from 1717. Operational. Open from April - September every second Sunday of the month from 2 PM - 5 PM. 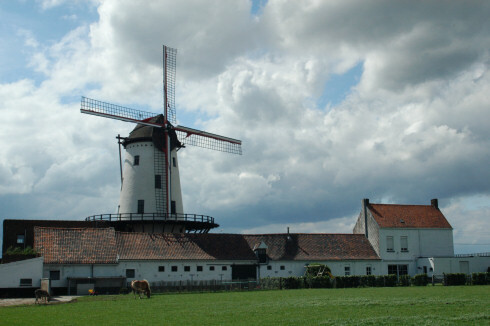 136 Molen Ten Hengst in Nukerke. Flour mill in bricks from 1834. Operational. Open by appointment. 137 Tombeelmolen in Outrijve. Flour mill in bricks from the 18th century. Rebuilt in 1923. Operational. Open from April - October every first and every last Sunday of the month from 2.30 PM - 5.30 PM. 138 Moulin du Cat Sauvage in Ellezelles. Wooden flour mill from 1751. Operational, but only open by appointment. 139 Moulin de Valentin in Saint-Sauveur. Small wooden flour mill from 1952. Open by appointment. 140 Le Blanc Moulin in Ostiches. Flour mill in bricks from 1789. Operational. Open during the summer months by appointment. 141 Moulin de la Marquise in Moulbaix. Wooden Flour mill from 1752. Operational. Open Saturdays from 2 PM - 6 PM. 142 Moulin Defrenne in Grand-Leez. Flour mill from 1830. Renovated in 1988. Operational. Open from Easter - mid October Sunday afternoon. 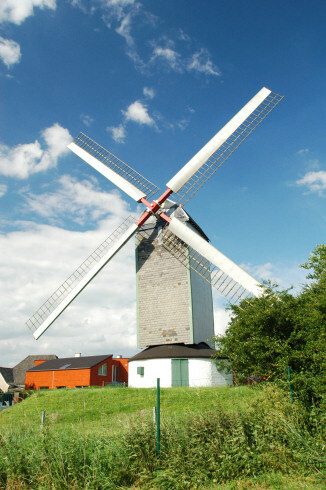 We would like to thank the site "http://www.molenechos.org/indexdb.php" for the info about the mills. Unfortunately the site is written in Dutch, but there are so many beautiful photos to be admired. Do a search per Province and you will have access to all mills in that province. Return from "windmills" to the Home page.